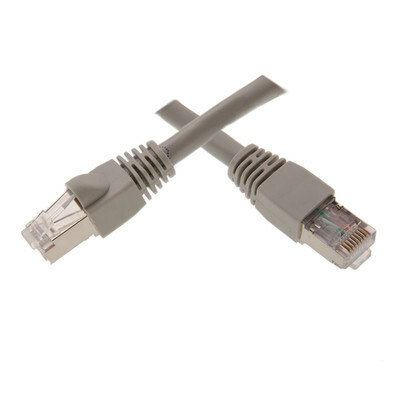 Shielded Cat6 Ethernet cables are typically used for networking, data transfer and for connecting phone lines. Cat6 cables can connect a cable or DSL modem to a router/switch in the home or office, or inside a server/network room. Cat6 cables were designed specifically for Gigabit Ethernet applications. These cables perform at high-data transfer rates; and exceed the EIA/TIA-568-C standard. Cat6 has stricter specifications for noise restriction and crosstalk than its Cat5 predecessor. This cable includes a spline to help ensure separation between the pairs which limits crosstalk. The individual conductors are 24 AWG (American wire gauge) stranded pure copper. Cat6 patch cables are stranded to improve flexibility. Pure copper conductors provide the best signal possible. These cables are shielded, which protects them from outside electromagnetic interference.